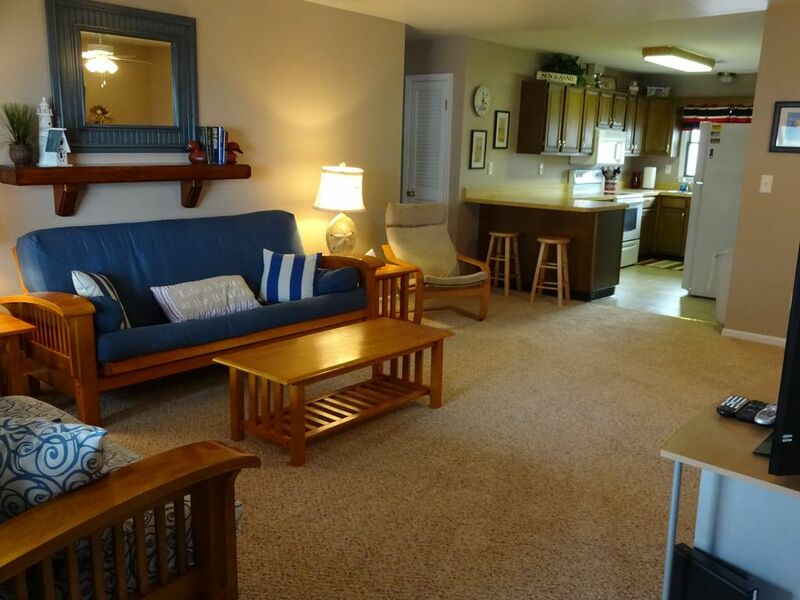 This property was clean, comfortable and very close to the beach. We very much enjoyed our stay here. The condo was beautiful and had everything we needed. it was so nice to sit and relax on the porch in the morning and again in the evening. We had just the kind of vacation we were looking for and will definitely return. It was that nice and I highly recommend it! Great place to stay in Ocean City. Beautiful views of the Bay and the Ocean from the front porch. Property is super clean and neat with plenty of room for everyone. The kitchen is well stocked and has everything needed for anything you want to cook. Away from the crowds at the boardwalk but there is so much to do within walking distance and the boardwalk is only a 10 minute drive away. Lifeguarded beach just steps away. Greatly enjoyed our stay and will definitely return. Awesome review, thank you so much. We love our place in Ocean City and are happy to be able to share it with so many. I love playing a small part in your vacation plans as I know how hard we all work for our money and we truly want everyone to enjoy themselves and leave as happy as you were. Condo was great, and couldn't beat the location. Close enough to attractions but far away enough to avoid the crowds. Thanks Doug for taking the time to write a review. Hope to have you back again soon. Fantastic vacation rental! Book it now before I book it again! This rental is as advertised! I stayed for 5 days with a family of 7, 4 adults and 3 kids... The unit was clean and we had plenty of space and room to sleep. It had everything we needed to make our stay enjoyable... Coffee cups, glasses, plates, pots, coffee maker pans, etc. You are steps away from the beach, plenty of parking and Carol the owner was wonderful to work with!!! I would rent this unit again next year, every year!!! Can't go wrong renting this unit!!! Jim, thanks so much for sharing a review and we look forward to having you back again next year. Or get in touch should you want to enjoy the off season experience. North Side Park (across the street) has a train ride that tours through their holiday light display which is a fun holiday thing to experience in Ocean City. The Best. 10 Stars. Alll Around. Property. The Owner. Just Wonderful!!! My Wife And I and 4 kids had a GREAT TIME. Definitely want to come back and Book with the Owner over and over. Just Wonderful !!! Thank you So Much for everything. Awesome review - thanks so much for your kind words and taking the time to review our unit and we look forward to having you back. We had a great stay here! The location is wonderful, very easy access to the beach. The condo was nice, comfortable, and very clean! And it was so great not to have to leave our fur babies out! :) Everyone enjoyed it! Carol was also super helpful. We will definitely be planning to stay here again! Thanks Chris for taking a few minutes to review our condo. We are happy that you and your entire family enjoyed our unit and look forward to having you back again.